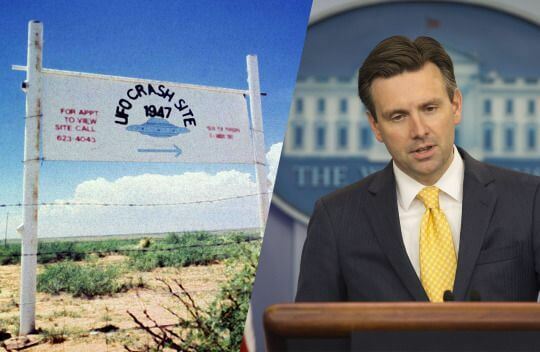 The White House on Monday carefully declined to get drawn into an election year discussion of whether the government stifled evidence that a UFO had crashed in Roswell, N.M., nearly 70 years ago. And President Obama’s chief spokesman, Josh Earnest, sidestepped a question about whether Washington has evidence of extraterrestrial life. “There are some questions that even the White House press secretary doesn’t have answers to, and this is one of them,” Earnest told reporters at his daily briefing. It’s not the uppermost issue on voters’ minds. It’s not the war against the so-called Islamic State. But the crazy 2016 presidential campaign has sparked a curious conversation about who would be the ultimate undocumented aliens — a discussion about just what crashed in the desert near Las Vegas in 1947. Former Secretary of State Hillary Clinton, the Democratic frontrunner, reportedly promised to “get to the bottom” of what really happened there and whether the government hushed up evidence of extraterrestrial life. That’s how the president described secret government files during a November 2015 interview with GQ magazine. That probably won’t smother Clinton campaign chairman John Podesta’s interest in the matter. Podesta, who served as chief of staff to President Bill Clinton and did a stint as an Obama adviser, tweeted upon leaving the White House in 2015 that his “biggest failure of 2014” was “not securing the #disclosure of the UFO files” held by the government. Podesta has also called on the federal government to declassify documents related to the existence of UFOs. “It’s time to find out what the truth really is that’s out there,” he declared at a 2002 press conference organized by the Coalition for Freedom of Information. “We ought to do it, really, because it’s right. We ought to do it, quite frankly, because the American people can handle the truth. And we ought to do it because it’s the law,” he said then. But Bill Clinton poured cold water on the notion in a 1995 speech in Belfast, Northern Ireland, after receiving a letter from a 13-year-old boy named Ryan.